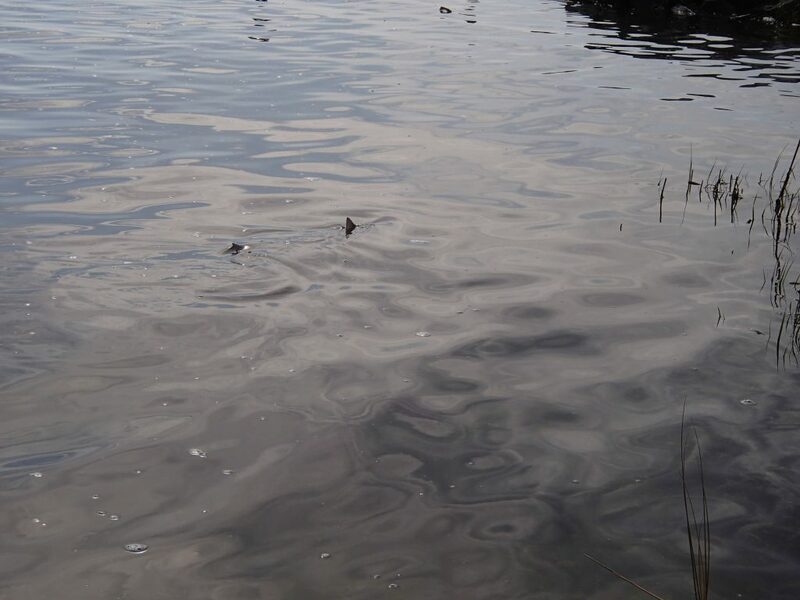 Sharks in Pamlico Sound: The Bigger Picture – Ya Like Dags? Some shark species love estuaries, and North Carolina has the second-largest estuarine system in the continental United States, the Albemarle/Pamlico system that includes the giant lagoon Pamlico Sound. North Carolina estuaries and the sharks that call them home have been on my mind for some time: estuarine sharks made up over half of my PhD dissertation and are a large part of my science outreach efforts. Recently two papers based on a major part of my dissertation work have been published, both of which are connected to each other and have long tendrils extending into a lot of my other work. So in keeping with this blog’s role as my personal-yet-public research diary, here’s the story behind how those papers on Pamlico Sound’s sharks came about, and how they’ve been and continue to be a huge influence on my current and future research. 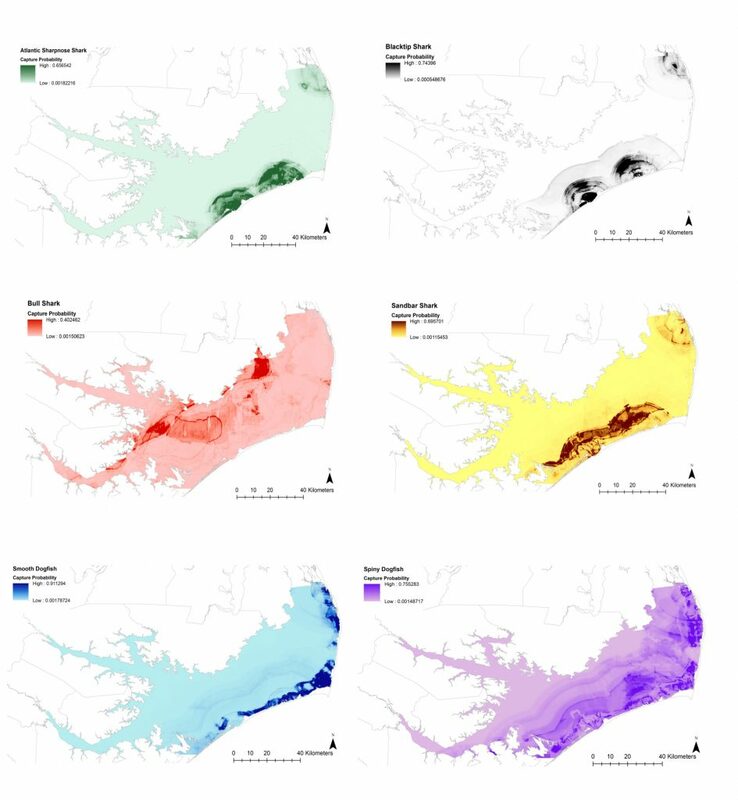 The first paper, published in PLOS One, focuses on an effort to characterize and map potential shark habitat in Pamlico Sound using catch data from the North Carolina Division of Marine Fisheries (NCDMF) fishery-independent gillnet and longlines surveys. You can get into the details in the summary blog post but the one-sentence version is this: there are at least 11 species of sharks found in Pamlico Sound, six of which are relatively common and present either at different times of the year or in different parts of the estuary. Species we were able to map habitat for included high-profile large coastal sharks (Blacktip, Bull, and Sandbar), small-but-fierce small coastal sharks (Atlantic Sharpnose and Smooth Dogfish), and the Best Shark itself, the Spiny Dogfish. These results show that Pamlico Sound hosts as diverse a shark community as any estuary on the U.S. east coast, and reinforces the importance of water temperature and salinity as major influences when the sharks show up and where they prefer to spend their time in the sound. Mapped habitat for the six shark species most commonly documented in NCDMF surveys of Pamlico Sound. From Bangley and friends (2018a). It was while working with this data set that my co-authors and I noticed an interesting trend with the catch of juvenile Bull Sharks. Juveniles of this species seemed to be very rare in Pamlico Sound prior to 2011, but from 2012 on they’ve been regularly documented in certain parts of the estuary (the data covered in the paper go up to 2016, but they continued to show up in the NCDMF gillnet survey last summer). This led us to look into whether this change in Bull Shark abundance may have been influenced by some change in the environment and resulted in the even more interesting (and somewhat disturbing) finding that increasing water temperatures and salinities may be involved. In short, conditions in Pamlico Sound are changing and becoming increasingly more comfortable for Bull Sharks looking for a place to give birth, which is causing the estuary to become a Bull Shark nursery habitat. Our results show that Bull Sharks are among the species whose distribution and habitat use patterns are being altered by climate change. This paper was published in Scientific Reports and also has its own blog post summary if you want to learn more about the findings and how we, um, found them. Appropriately enough, both of the papers on the sharks of Pamlico Sound ended up going live within the same week. This wasn’t totally intentional and up to the publication date I had an unofficial running bet on which would be released first, but it ended up fitting the narrative between these two papers well. Sometimes the vagaries of peer review and scientific publishing work out nicely. The story isn’t over for my relationship with North Carolina’s estuarine sharks. Pamlico Sound and its newcomer Bull Sharks raise enough questions to fill a whole lab’s research portfolio. I’m already working on a follow-up study supported by North Carolina Sea Grant using genetic analysis to determine whether these sharks are related to other nearby populations (and therefore may be immigrants from those areas) or represent a distinct population that for some reason we just didn’t observe until recently. As part of this project, juvenile Bull Sharks are also being fitted with acoustic transmitters so their movements can be tracked and we can determine whether these sharks stay in Pamlico Sound year-round (as they do in already-known nurseries in Florida and the Gulf of Mexico) or leave for the winter. If it’s the latter, where are they going and will they come back for the summer? We’ll be finding out, and these sharks will also be contributing their data to the Smithsonian Movement of Life Initiative, which will compare their movements with those of Bull Sharks from other areas and other shark species. Spiny Dogfish finning around in Bogue Sound. Photo by Bangley. There are other sharks and other estuaries in North Carolina too. During my grad school years, I organized an inshore shark survey to characterize shark and ray habitat in the Back/Core Sound estuarine system (which is much smaller than Pamlico Sound but very well-studied thanks to the proximity of the Duke, UNC, and NC State marine labs). This survey was also supported by NC Sea Grant and resulted in a paper published in the Bulletin of Marine Science (blog post summary here). Back and Core Sounds proved to be a bit warmer and much saltier than Pamlico Sound, so there were some pretty significant differences in the elasmobranch community but no less overall species diversity. I continue to look for sharks in North Carolina’s inshore waters working with the North Carolina Aquarium Society and partners at UNC Wilmington on a shark and ray survey in the tidal Cape Fear River. Though I no longer reside in North Carolina full-time, the estuarine sharks just keep pulling me back. It’s been great to continue collaborating with researchers in North Carolina and to forge new partnerships to figure out what the local elasmobranchs are up to. And it’s been even more awesome to see what other researchers are able to find out about North Carolina’s sharks. I think exciting new things are going to be learned about the elasmobranchs of the Old North State, leading to just as exciting new questions, for a long time.